"Reach," a high school dramedy about bullies and the power of friendship,will be screened for the first time at the American Film Market (AFM) for distributors Nov. 7 at 10 a.m. in Santa Monica, announced co-writer and producer, Maria Capp, Cappricielli Productions, Inc.
To attend, distributors can contact Capp directly. Autumn Bailey and Charles Box produced "Reach" along with Capp. Garrett Clayton ("Hairspray Live! "), Jordan Doww ("HollyWEIRD") and Joey Bragg (Disney's "Liv and Maddie") are among thecast of talented young Hollywood actors in "Reach." Capp co-wrote the script along with Johnny James Fiore and Grant Harling, who both also star in the film. "We're excited about the interest from distributors, and are scheduling meetings for this weekend ahead of our Distributor Screening on Tuesday. We released the AFM Teaser Poster for 'Reach' today featuring our high-profile cast of young talent, and I know their fans will love it! On December 15, we are giving away four autographed posters for four lucky fans, one from our website, and one from the 'Reach' Facebook, Instagram, and twitter pages," Capp said. 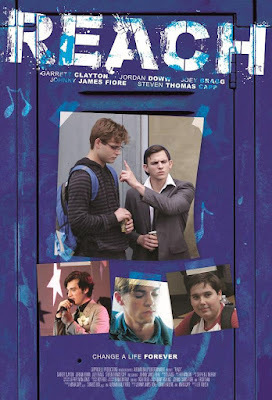 In "Reach" a socially awkward genius, Steven Turano (Garrett Clayton), divulges to a pro-suicide support group that he plans to kill himself. Although his first attempt is unsuccessful, he is determined to find a way to escape his suffering. He is constantly picked-on by former childhood friend and school bully, Nick Perkins (Jordan Doww), and his widowed father, for whom he harbors a deep resentment for over his mother's death. However, when Clarence (Johnny James Fiore), the new quirky kid in school, befriends him, Steven's plans are side-tracked, and he begins to "REACH" out beyond his comfort zone to form stronger relationships with his father, friends (Joey Bragg, Steven Capp, Rio Mangini) and teachers. Bojesse Christopher, Kevin Sizemore, Concetta Tomei, Corbin Bernsen, Raffaela Capp, Steven Thomas Capp, Rio Mangini, Natasha Capp, Brent Tarnol, Michelle Danner and Chelsea Cook round out the cast. "Reach" is a window into the private lives of both bullies and their targets, and shows how the power of one small gesture can change the course of one's life. "Reach" was awarded Best Feature Screenplay in The Hollywood & Vine Film Festival in 2015. Clayton is represented by Gersh, Industry Entertainment and Gang, Tyre, Ramer & Brown; Doww is represented by Clayton Santillo at Scale Management, United Talent Agency, and Stone, Genow, Smelkinson, Christopher & Binder; and Bragg is represented by Ray Moheet at Mainstay Entertainment and David Lederman at Innovative Artists.